[11-Apr-2017 10:27:11 UTC] id was called incorrectly. Order properties should not be accessed directly.. This message was added in version 3.0. [11-Apr-2017 10:27:11 UTC] order_key was called incorrectly. Order properties should not be accessed directly.. This message was added in version 3.0. [11-Apr-2017 10:28:18 UTC] The woocommerce_get_page_id function is deprecated since version 3.0. Replace with wc_get_page_id. WooCommerce now prefers you to access class properties via setters/getters ex: $order->get_id() instead of directly accessing the properties $order->id. Unfortunately, WooCommerce’s error messages don’t say where the problem code is being called from. You will have to go through all your plugins and your theme to make sure they are 3.0 compatible. I’d disable them one at a time to see if you can narrow it down. But you have to understand that we are having eshops running and it is not very convenient to try stopping 20 plugins 1 by 1. And also taking in consideration that several of the plugins have major roles in the eshops functionality. We are having ad campaigns running on optimized pages, and several visitors on site every second. Please provide us with a more practical solution with that. If you knew what you were looking for like @helgatheviking is stating possible use of $order->ID then you could just do a search in all files on your site using a plugin called String Locator. In the example below I search $order->id, but I only bring up code being called out in woocommerce files it looks like so I would almost want to say that maybe helgas example may not be what is up. I am not super technical, but you could search the field in your error, see if a file pops up in a plugin folder path that might be named with a suspect plugin to help limit things. Could also click through your site, while pinging your log to see if you can replicate the log error. If you can determine a possible click the sends the error or page load that sends the error, then you could compare sourcecode on that page/previous page depending on if you are clicking something, versus what you find in string locator to better pinpoint things. This reply was modified 2 years ago by caseydoes. Set up a duplicate dev site in a separate folder or on your local machine to do the searches and changes (and testing) on. Yes its a pain, but its the only way you should be doing it for a live site anyway. Also you might want to contact the support for the woo plugins that you do have and ask them about 3.0 compatibility fixes. Sadly, my theme support already finished so can’t contact them. 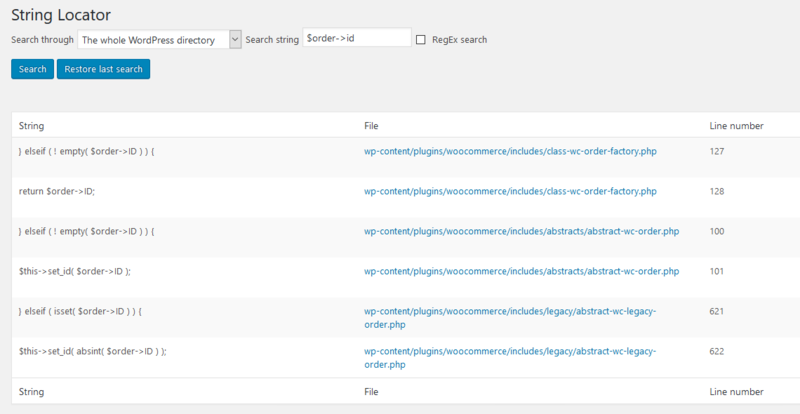 The topic ‘Help finding source of incompatibilites with woocommerce 3.0.1’ is closed to new replies.